If you are looking for a unique husky trip in the snowy north or you just want to browse. Personal advice and fair prices. Travellers choose us for good reason. For a break like no other, escape to the far north for a once-in-a-lifetime husky sledding experience. This tour is perfect for beginners and more experienced dog mushers. Dog sledding tours and husky tours: experience pure nature! On a dog sled tour, you can enjoy endless winter landscapes on holiday. Experience life without noise or light pollution, where you can see a clear night sky and the only sound is that of the snow crunching underfoot and the panting fo your excited Huskies. Relax far removed from civilisation and daily stresses. Get to know your team and after a short time you will know that you can rely on the dogs. Trained guides instruct you in the handling of the dog sled, an experience that will help you learn a lot about these friendly and capable sled dogs. In the evening feed and take care of the dogs. Enjoy comfortable accommodation with rich catering and relaxation facilities such as a private jacuzzi or sauna. These tours offer the perfect balance of physical activity and relaxation in nature. These husky tours are available in different levels of difficulty - from easy to normal to challenging, and even take into account family-friendly tours and activities. You also have the choice between weekend events or longer tours, so there is something for everyone. You will get the chance to know the unique landscapes of Scandinavia, Greenland, Canada, or Alaska in a totally unique and authentic way. Rural tours and homestay programmes can also be arranged for you to truly get an insight into this way fo life. Snow and vastness is probably what most people associate with Scandinavia. A dog sled ride over wide plains, frozen lakes and rivers is an incomparable experience on winter holidays. We offer sled dog holidays in Sweden, Finland and Norway. In the Husky Tours Scandinavia you will also find activities that are suitable for families with children. These are marked as "light". For the overnight stays — hotels or comfortable log cabins are available. In addition to the husky tours, snowmobile rides, snow shoeing, cross-country skiing and meeting reindeer are also available activities. If you are physically fitter, you can book a husky tour marked "normal". These trips are daily longer trips on the dog sled on the programme. Experienced dog sled guides teach you how to ride a sled and how to use the equipment you will need. In addition to these offers, it is also possible to try other winter sports, such as ice fishing. For those who already have experience with a dog sled holiday, there are more demanding and challenging tours for you to participate in. In Scandinavia everyone will find an ideal husky trip, regardless of taste or ability. Lapland is generally understood as the part of Scandinavia which lies north of the Arctic Circle. The area covers multiple countries including Norway, Finland, Sweden and Russia. The area is sparsely populated, with only approximately 2 people per 1km². In the east, the country is flat and rises to the west. On the border between Norway and Sweden, the landscape rises to the mountains, with mountains up to 2,000m in height. Across national borders there are numerous national parks and nature reserves, which together form one of the largest protected natural areas in Europe. An ideal terrain for dogsledding through Lapland. With this environmentally friendly mode of transport, we can drive to the furthest corners of the national parks and leave nothing but pawprints. For this overwhelming nature experience you should have a medium fitness level. If you already have experience in driving Husky sleds, you can also participate in more demanding tours with longer trips. For beginners, a Husky taster weekend is usually perfect as it does not require a lot of physical fitness and you will get your first experience with sled dogs and the technique of sledging. Nevertheless, you can experience the great nature of Lapland with these offers. These introductory events are also suitable for families with children. The Husky holiday in Norway has a lot to offer: Husky farms, sled dog breeders and sled dog specialists complement the dogsledding tours. Regardless of whether you only have a few days, a longer trip or an expedition in Norway, this holiday will give you an unforgettable experience. With a team of four to six dogs you will glide almost silently through untouched nature. For overnight stays, camps from winter tents or cosy, rustic furnished cabins are available. The small tour group quickly becomes a well-rehearsed team. Lunch around the campfire in the winter landscape is a special experience, and you will also get the chance to meet reindeer herders or visit a local village. 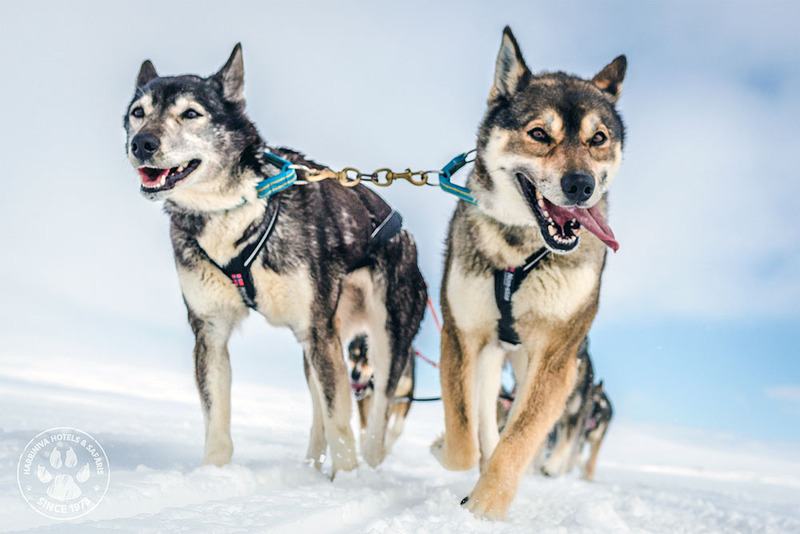 You will learn a lot about the capable sled dogs from specialists for these animals, as well as the technique of dog sledging from experienced guides so that you can easily drive your own team quickly. For this only a good fitness level, ability to concentrate and have fun with the handling of the dogs is necessary. If you still have problems with the sled or dogs, you can always ride with one of the guides. In the magnificent nature of Norway you will glide through snowy forests, through frozen swamps and over frozen lakes. If you are lucky, you might encounter moose and reindeer on the way. Depending on the season, you will have the chance to see the Aurora Borealis aka the Northern Lights on our husky tours through Finland. 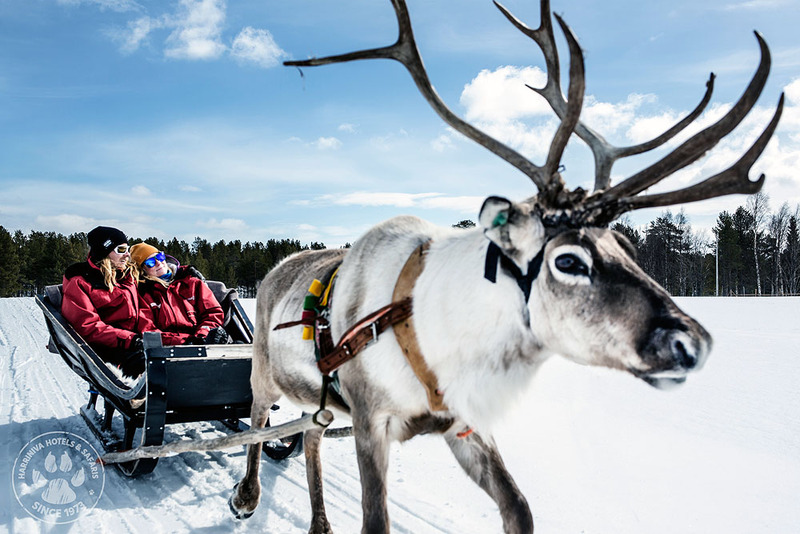 In addition to the sled tours, they also have the opportunity to try cross-country skiing, snowshoeing and even a ride in a reindeer sled. The trips are offered in all difficulty levels and with different travel durations. So everyone should be able to get to know the unique nature of Finland and its national parks. Depending on the type of trip, you can spend the night comfortably in furnished log cabins, in comfortable lodges or in stylish hotels. On Husky farms you will get to know these friendly and willing animals and learn a lot about their breeding and care. You may also visit a reindeer farm. Seeing a reindeer up close is a special experience, especially for young children. The necessary clothing for the sleigh rides such as cap, gloves, parka and boots are all provided. For most tours, no dog sledding experience is required. If you do not trust yourself to drive a sledge, you can always ride on the sled with a guide. So that you can enjoy the journey in the best possible way, please check beforehand if you meet the programme requirements of physical fitness. You will also get the chance for relaxation on these trips, and you will find almost everywhere offers a traditional a sauna or an indoor pool. And of course you can spend the evenings relaxing by a cosy fire in the company of your fellow travelers. There are 28 national parks throughout Sweden, so you can discover a lot of untouched nature; you may even find moose, wolves, bears and reindeer romaning the wilderness around you. On a dog sled you will glide effortlessly through the white splendor, leaving the nature unspoilt, just as you found it. Whether you just want to spend a weekend there or book an eight-day expedition, there is a tour to suit every taste and ability. If you are interested in dog sledding and dog training, you can also book a stay on a husky farm and actively participate in the training of the animals. If you want to learn how to ride a dog sled, then you have the opportunity to spend a weekend away to do just that. In small groups you can learn everything worth knowing about sleds, driving technique and the dogs. Those who already have experience in handling dog sleds and are accordingly fit, an expedition tour offers exactly the right thing for you. 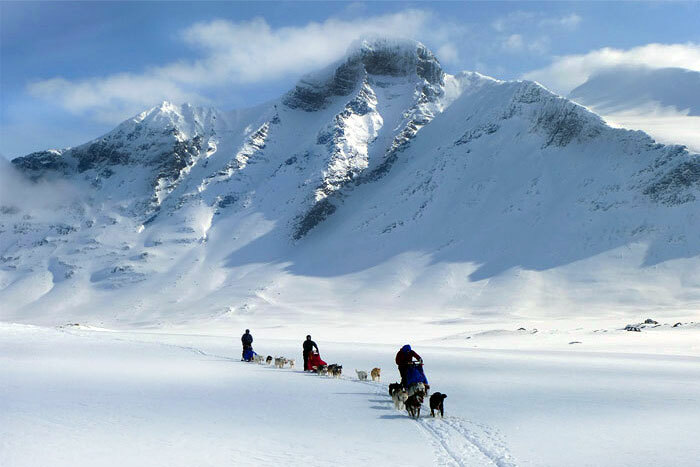 For experienced dog sled guides, these tours through the national park are a wonderful adventure. The dog sled was once the only means of transport in Alaska. Even today, there are still areas that are accessible only by sled. Those who want to enjoy undisturbed nature far from civilisation, should take a tour with the dog sled. Huskies are friendly, joyful pack animals that do not mind cold and pulling the sledges. On the contrary, running in packs is a lot of fun. Have you ever ridden a dog sled? That does not have to be a hindrance. If you have at least an average fitness and like dogs, you will learn how to use the sled quickly. The necessary equipment, also for you personally, will be put at your disposal. So you can easily enjoy the endless expanse of Alaska, the alternation between valleys, mountains and glaciers. For beginners, we offer trips on which you first learn how to handle the huskies and the sledge, in order to independently lead a dog sled in Alaska on later tours. These tours are also suitable for young people from the age of 14, provided that a parent or legal guard is with us. Due to the small size of the groups, experienced guides can respond individually to the guests needs. We also have attractive trips for experienced dog sled guides, during which you can stay in the wilderness and are responsible for your dog team from start to finish. For sporty dog ​​lovers this is a truly unique experience. The Yukon Territory in northwestern Canada owes its name to the Yukon River. This area is associated with trappers, gold miners and adventurers. The area is sparsely populated with only approximately 0.06 inhabitants per square mile. On the other hand wolves, bears and moose fare very well there. Most people live around Whitehorse, the capital of the territory. Since in former times the dog sled was the only means of transport in winter, sled dog breeding has a long tradition in these parts. Malamutes and Huskies are tough and can pull fully loaded sledges through rough terrain even in extreme weather conditions. Our sled dog tours in the Yukon are aimed at adults over the age of 18 who have at least a normal fitness level. 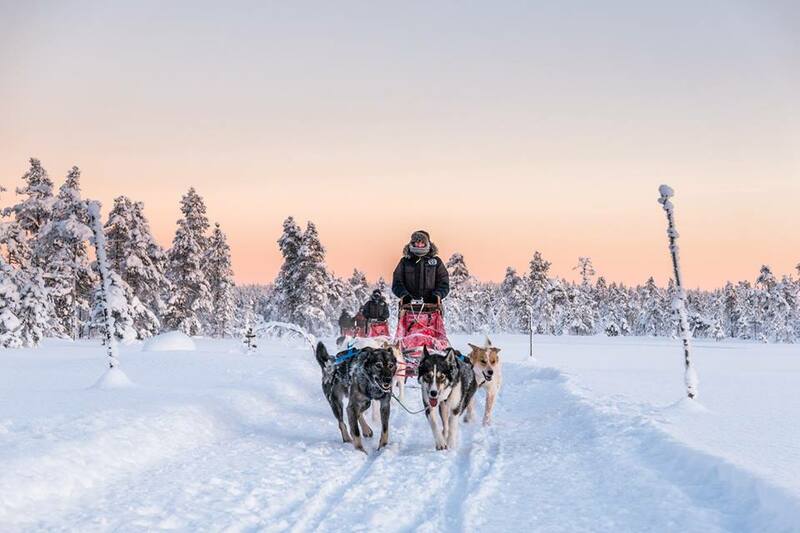 Experience with the dog sled is not required, as the trips are designed so that you first have the opportunity to get to know the dogs and familiarise yourself with the driving technique. Then you can go on longer and more demanding tours. During these camp-to-camp tours, you will spend a few nights in the wilderness. Whether you choose a shorter or longer trip, you will certainly have a unique holiday experience. A dog sledding tour in Greenland is just the thing for adventurers over the age of 18, who do not care about comfort. On the Greenland tours you will drive over sea ice and frozen fjords. Winter tents are available for the overnight stay. The sledges used in Greenland and the type of harnessing of the dogs differ from the usual forms. So there are sleds in different sizes and shapes, depending on the purpose. The dogs are not stretched as a pair in a line, but fan-shaped in front of the sled. Even the dogs themselves are a different breed than those used in Scandinavia or America. The Greenland Husky is more spirited and less peaceful. So these trips also offer experienced dog sled guides an interesting new challenge. But even those who have no experience with dog sleds, can safely go on such a journey. The experienced guides will provide you with everything you need during the first days of the trip. On a Husky Tour Greenland the exact itinerary may depend on the weather, but you will definitely experience a unique landscape and visit small settlements on Greenland. Even the overnight stay in a camp in the wilderness is a unique experience. With a little luck, you can also observe the Northern Lights.